Lanercost Priory is a fascinating place. Dating back to the late 12th century (1169 is the generally accepted year of construction of the Augustinian priory built by Robert de Vaux), it is a fine example of early medieval monastic architecture. Although the monks have long since left, it is still a place of worship today. The Priory was visited no less than 3 times by King Edward I of England. During one stay which lasted for more than 5 months in 1306-1307, it became a 'royal palace' - something few monasteries could ever lay claim to. 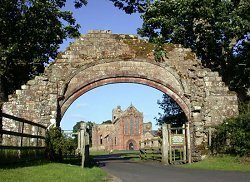 Edward brought the Seal with him to Lanercost and thus, for the duration of his stay, technically made this tiny Cumbrian village the centre of government for the whole of Britain. With the king came a large retinue of servants and although it benefited the local community by way of an increased demand for food, game, wine and fuel, it also brought great pressure to bear on the monks and others who were expected to serve without excuse or hesitation. One thing the king's stay did achieve, however, was to halt the previously commonplace attacks by the Scots raiding from across the border. In 7 July 1307, after leaving the Priory and heading North towards Scotland, King Edward I took ill and died near Burgh by Sands in Cumbria (a large stone cross marking the spot can be seen there today). His son became King Edward II but paid little attention to the North of his kingdom and, as a result, Scottish raids on the area around Lanercost became more frequent. This culminated in the attack on Lanercost Priory by Robert Bruce in 1311 and then later in 1346 by a large Scottish army which crossed the border and plundered the Priory. Although some rebuilding took place including a new roof over the Nave with further renovations continuing over the centuries, the Presbytery of Lanercost Priory still has no roof even today and remains open to the elements. For those interested in medieval castles, King Edward I also owned Skipton Castle (built in 1090) and visited both Norham Castle (built 1160) and Chillingham Castle (en route to do battle with William Wallace).